With every major license from Cars to Harry Potter to Batman to Pirates of the Caribbean having a tie-in series of LEGOs these days, it’s no surprise to see a line of Transformers construction sets. What may be a surprise, however, is that this line isn’t licensed at all–it’s being put out by Hasbro themselves and has been dubbed “Kre-O”. 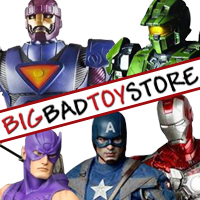 The line encompasses both Generation 1 and Movie versions of Transformers, and range in price from $8-$60. All of the sets except for the absolute cheapest ones include mini-figures called Kreons which are either chibi versions of Transformers or human sidekicks. 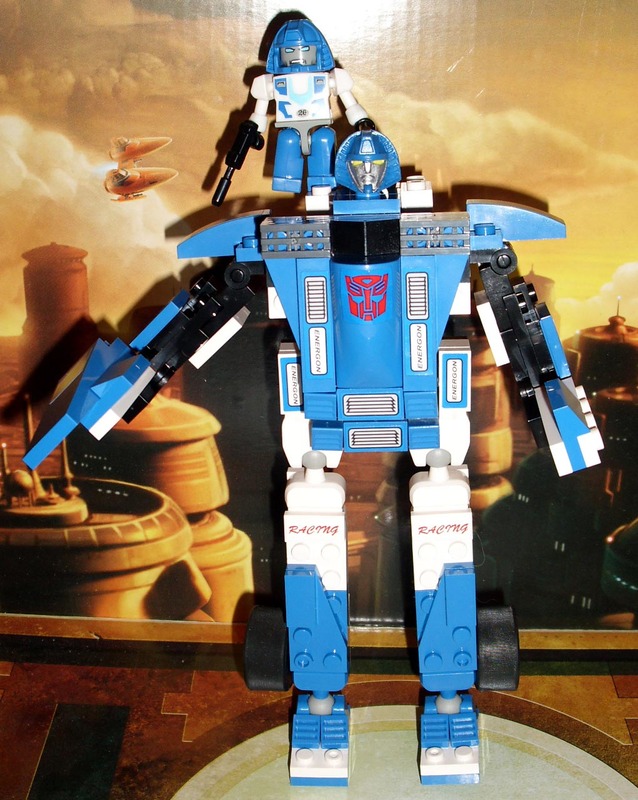 Tonight, I’ll be covering a small G1-inspired version of a perennial favorite Autobot, Mirage. Before going any further, there’s something I think needs to be addressed. The common misconception out there is that Transformers Kre-O kits allow you to build a vehicle that transforms into a robot. That isn’t quite right. 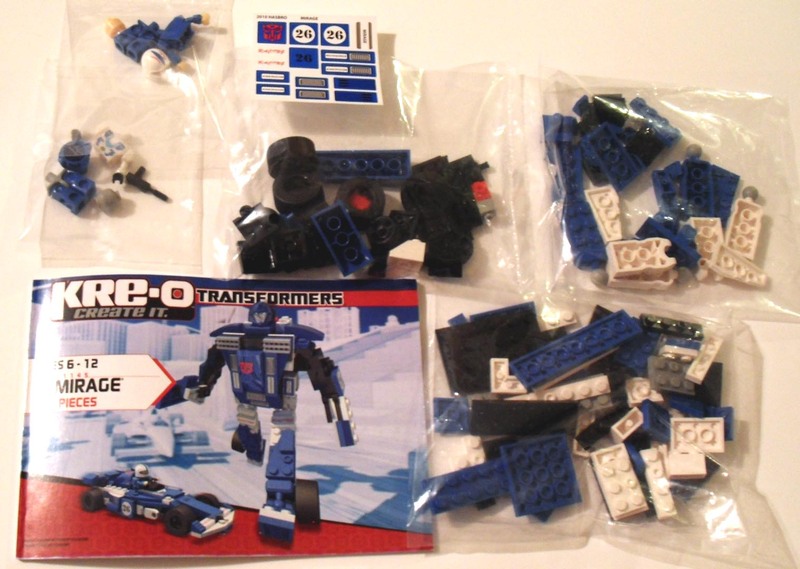 These kits contain the bricks necessary to build a character (in this case Mirage) as either a robot or a vehicle, but you have to completely disassemble your creation each time you want to rebuild it in an alternate mode. At $11.99, I feel like this set was a tremendous value. You get 119 pieces which is around my construction block sweet spot of 10 cents per piece and a well-designed set with an alternate mode as well as two mini-figures. I think anyone who complains about the pricing on these sets is either unrealistic or just not used to the construction set marketplace, as a LEGO set with 119 pieces would always cost more than $11.99–and more importantly, wouldn’t be able to be built into a Transformer. The instructions are full-color and carefully explain step-by-step how to build each mode from scratch with ease. I’m nowhere near a master builder, and I was able to follow the instructions and build both forms with minimal difficulty. 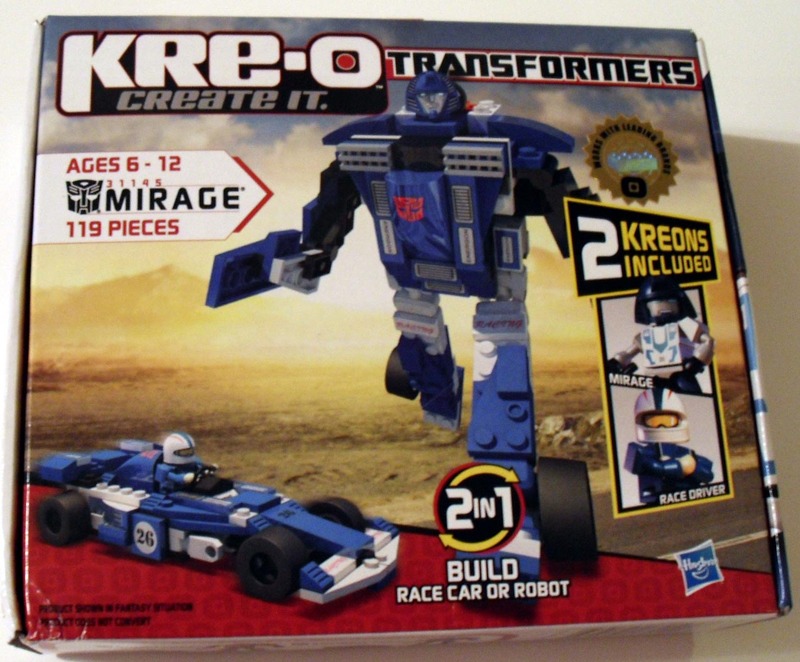 Like all good construction sets, Kre-O Mirage includes instructions. Kre-O Mirage took me a little less than an hour to build from a pile of blocks into a robot. Mirage has ball-jointed feet, legs, and neck, as well as swivel-elbows and shoulders for more articulation than you’d expect from a Transformer made out of blocks. He’s the right colors, strongly resembles G1 Mirage, and is just barely out-of-scale and a bit on the big size to display next to the deluxe Autobots from the Transformers Classics toyline. But even so, he fits in pretty good for an Autobot made entirely of blocks. 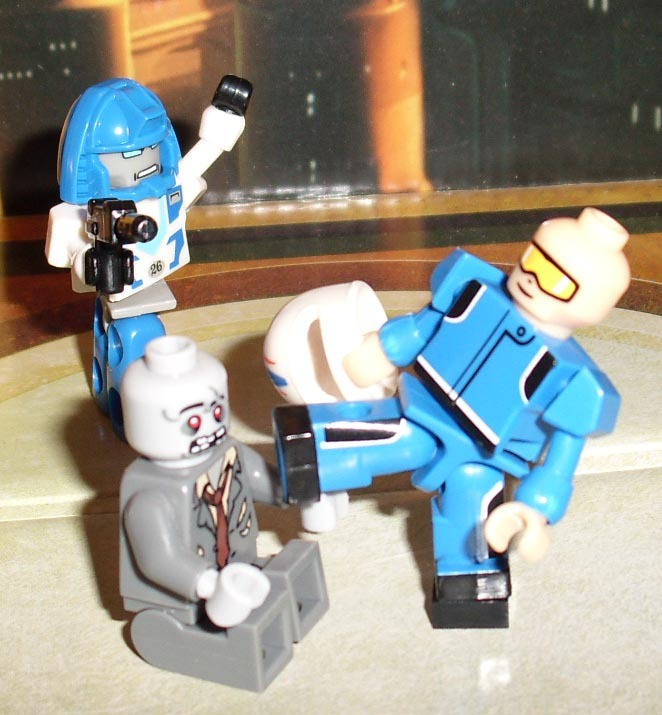 With Kreons' articulation, you can karate kick LEGO Zombies heads off! 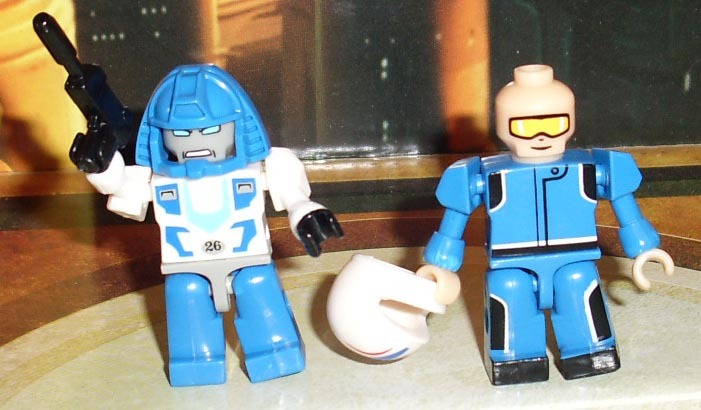 Mirage comes with two Kreons: a human race car driver and a chibi-fied version of Mirage. The most exciting features of the Kreons is that they have ball-jointed arms and legs! That alone makes them vastly superior to LEGO mini-figures in articulation and posing possibilities. I think it’s also worth mentioning that Kre-O blocks have been deliberately designed to be compatible with “other leading brands”. What this means is that you can mix and match your Kre-O blocks with your LEGO blocks! 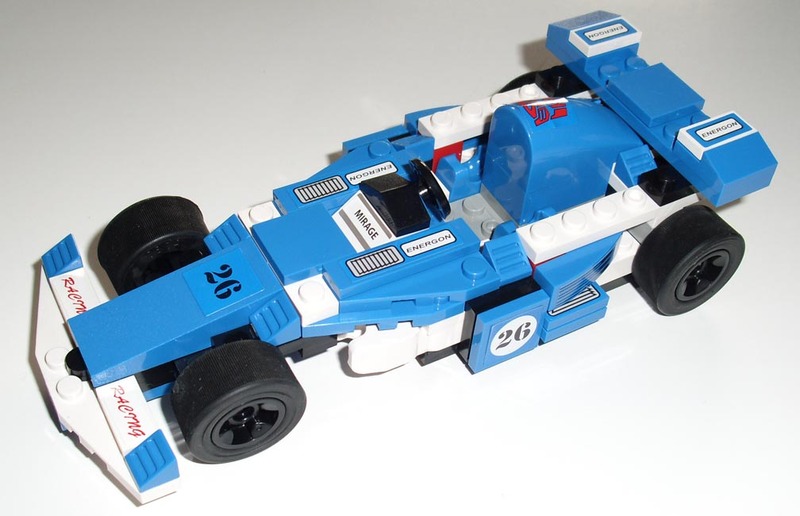 I was shocked to see how snugly LEGO blocks and Kre-O blocks snap together, and your LEGO mini-figures are even sized perfectly to drive Mirage in car mode! Considering that many construction set fans have already invested in thousands if not tens of thousands of blocks, this seemingly minor detail is a huge advantage for custom set builders who want to add onto these Kre-O sets. While the little Kreon Mirage has a gun to wield, the actual Kre-O Mirage comes with nothing to hold in his hands. In fact, Mirage doesn’t even have any discernible hands. I understand the difficulty in designing these sets such that there will be a way to masquerade the hands in vehicle mode, but since Mirage has extra pieces left over in either mode, Hasbro might as well have included hands to snap into Mirage as a robot (similar to how Trailbreaker and Hoist’s hands worked in G1). No matter whether you’re building Mirage as a robot or a race car, there will be blocks left over. I understand why this is with a toy of this nature, but it still seems strange to me to have pieces of Mirage’s body sitting around separate after transforming him. I’d have liked to have seen them engineer this so there was always a place for every piece, and hope that feature is integrated into future Kre-O sets. There are no printed blocks in this set (besides the pieces that make up the Kreons). That means that you have to apply decals to many pieces on this toy, and if you’re a perfectionist like me that can be quite an ordeal. With nerve-wracking care and patience I managed to get the stickers onto the blocks as straight and aligned as I possibly could, but they’re still mildly asymmetrical and it’s really quite annoying. 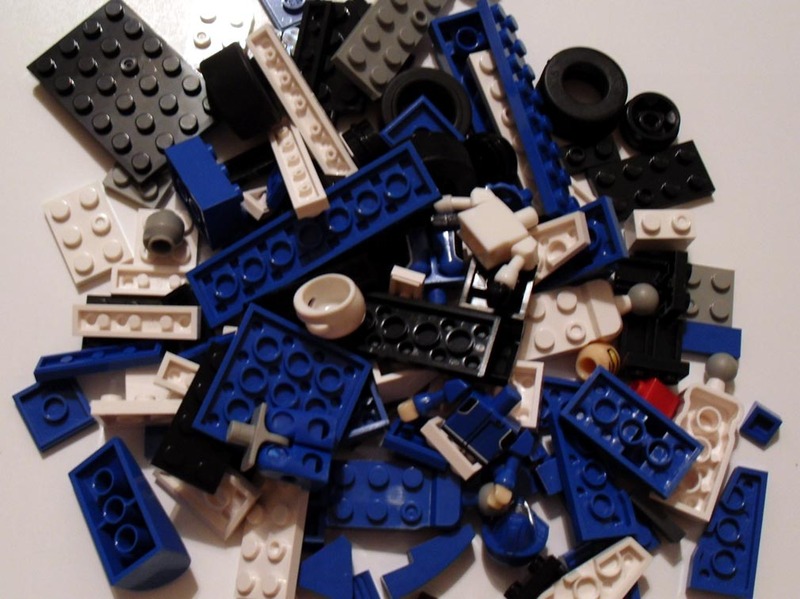 This same problem plagues many modern LEGO sets, and it’s just as troublesome here. I also think it’s worth pointing out that Kreon Mirage is probably the absolute worst of all of the Transformers Kreons mini-figures released thus far. The design that they used for this mini-figure looks absolutely nothing–nothing–like either the character or even the Kre-O rendition of the character. Considering all they needed to do was properly print the design onto the generic body, I really don’t know what happened here. ...Neither one really looks all that much like Mirage, to be honest. Most toy retailers have this set available right now, but you can also order it from Amazon.com for just $12 with no tax and FREE Shipping. That’s a pretty good deal, considering this toy cost me $13+ after tax and I had to spend time and gas going to the store to get him. Overall: I struggled a lot with how to rate this kit. Is this a perfect Transformers construction kit? Absolutely not. But–could LEGO or any other company have done better for $11.99…? No. I really don’t think so. This is a good toy that looks like a beloved Transformer in both vehicle and robot modes, comes with some cute mini-figures, and is fun to build and display in either form. It’s not perfect, but for a brand-new line of construction sets it is pretty damn good. 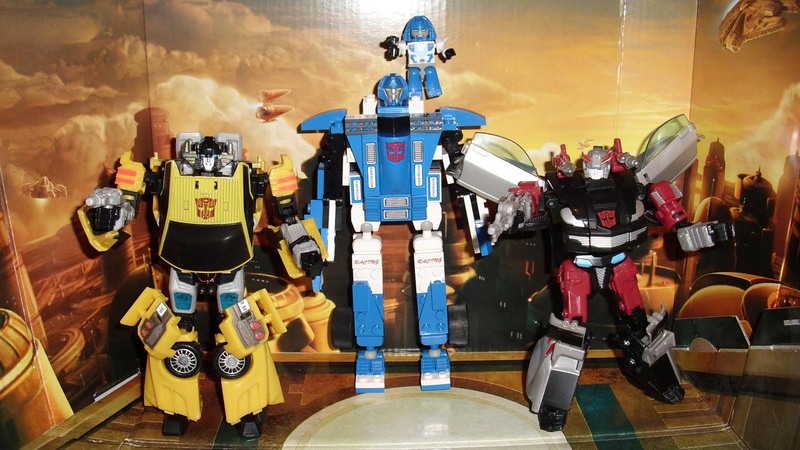 This entry was posted in Collecting, Reviews and tagged Autobot, Hasbro, Kre-O, Kreon, LEGO, Mirage, Review, Toy Review, Transformers, Transformers Classics. Bookmark the permalink.